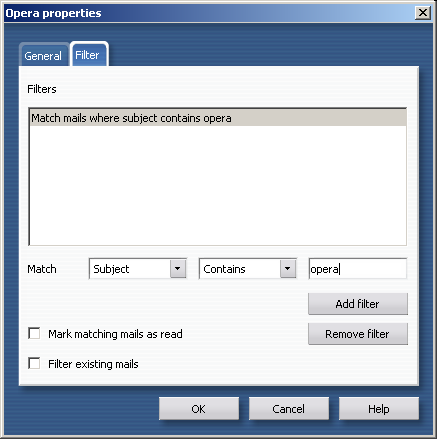 Opera 7 comes with a totally rewritten mail and news client, with support for POP3, IMAP and (E)SMTP. The client (called M2) has many new, innovative and unique features. This means that in many respects, M2 behaves differently from most other mailers, and therefore requires some additional instructions before you start testing. This document will explain some important features of M2 and will also describe how to import your existing e-mail into Opera 7, so that you can commence testing. Please note that M2 is still a beta program: some things will not work properly and features may still be added before the final release. New features will also be added in future versions of Opera. Please discuss bugs and problems in the opera.beta newsgroup or in the MyOpera community forums before reporting them through our bug tracking system. The most important and innovative feature of M2 are the access points. They are not a mere feature, but form the foundation of the way M2 works and replace the customary way of organizing e-mail. Consider having one database of all your e-mails. If, for instance, you would want to view all e-mail from a friend, you search the database and view the result. Or if you would want to view all e-mails with an MP3 attachment, you search again, and so on. The important thing to understand is that access points are like searches into your e-mail database (your list of e-mails), where the "search results" are e-mails. Access points show all e-mails which fit a certain description, but they do not contain the actual e-mails. This makes them different from the mail folders you might be familiar with, where an e-mail is stored in a folder and only visible there. In M2 an e-mail may show up in several access points, if it fits the descriptions in each of them. For instance, if a friend attaches a document to an e-mail, the e-mail will show up under the "Attachments" access point as well as the "Contacts" access point. As the quote above illustrates: access points go a long way toward organizing your mail for you. It is just so much easier than with regular folders. There are a variety of standard access points in M2. These will be described briefly further down in this document. In contrast to other mail programs, M2 doesn't require you to do a lot of work creating and maintaining entries in an address book. The Contacts list follows naturally from M2's use of access points. To add a contact to your list, just press "A" when viewing an e-mail (or select the option in the right-click menu). Each contact in the Contacts list is an individual access point. By clicking on the contact, you get to see all the e-mails from that person. The idea is to add all your contacts to the contacts list, so that you can easily spot an e-mail from an unknown person by the blank icon to the left of the e-mail. In the contacts properties (right-click, select "Properties") you can change the information of the contact and add an URL to a picture for instance. This picture will then be displayed when viewing the e-mail from that contact. Another helpful feature linked to the contacts system is the following: when reading an e-mail and you want to view all e-mails by the same person, just press "E" (or select the option in the right-click menu) and voila: a list of all the e-mails! A useful feature is the "sticky" search. When you perform a search (either from the inline searchfield in the hotlist or from Mail --> Search), the search "sticks" : it is placed as an access point in the hotlist. This also means that it will also filter future mail that fit the search criteria. You can search for different criteria and also use different types of search. The "Each word" search is somewhat similar to the Google way of searching: the search results contain these words. By adding a - (minus) in front of a search term you determine that the phrase must not be included in the results. Any word without a minus in front of it is always part of the search. The access points are situated in the hotlist, under the "Mail" tab. A short overview will be given of the ones presently available, starting from top to bottom. You may or may not see some of the access points I mention, but they will appear when needed. For instance the mailing lists access point will not appear if you are not subscribed to a mailing list. When deleting an e-mail in access point, this effectively deletes it entirely, not just from that access point! It is not possible to exclude certain e-mails from being viewed in access points. This is where the unread mails are shown. It can be specified to show/hide unread "spam", "mailing list" and "news postings". This can be set under the right-click menu. In M2 the e-mails are not marked read automatically. By pressing "K" or clicking on the button on the mail toolbar the e-mail can be marked as read. The "My Mail" area is where the e-mails are actually stored. The "Received" access point is the repository (the mail database) where all received e-mail is stored and from which all other access points retrieve the e-mails. E-mail in for instance the Outbox and Trash are not accessible via the access points. M2 comes provided with a spam filter. The level of this filter can be adjusted to "Off", "Medium" and "Strong" by changing the settings under the right-click menu of the Spam folder > Properties > Filter. The default value is "Medium". M2 shows all mail which it recognizes as spam, in the spam folder. Here you can determine whether the mail is spam or not. When it is not spam, you click on the appropriate button on the toolbar, the e-mail becomes accessible to access points and the sender is added to your contacts. In M2 folders are also access points, making them "virtual folders". You can add folders by right-clicking and selecting "New folder". It is also possible to filter into different folders. The filtering criteria of a folder can be edited by right-clicking on a folder and selecting "Properties". It is possible to add and combine multiple filters per folder in the dialog shown above along. Refiltering (filtering existing mail as well as future mail, similarly to a search) is also possible. To remove an e-mail from a folder, but not delete it entirely you can press Ctrl-X, or select the option in the drop-down button next to the "Delete" button on the mail toolbar. To emphasize: M1's centralized filtering system is replaced by a 'per folder' filter in M2. Contacts with whom you have a lot of correspondence or who you recently selected in the contacts tab, are shown here for easy access. When viewing an e-mail, it can be given a label by selecting it from the dropdown box on the mail toolbar. You can choose between things like "to do", "call back", "important" etc. The e-mails with the same labels can be viewed from the "Labels" access point. This feature can make organizing your e-mail much easier. As has already been discussed before, a search "sticks" and becomes an access point. 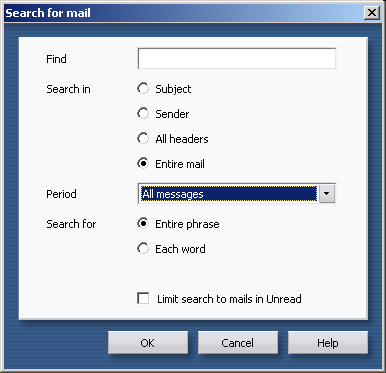 You can remove it by right-clicking it and choosing "Delete"
You can also use the "Quick find" feature available from the mail view window to search incrementally through the e-mails available in the current folder/access point. You can view all e-mails with certain kinds of attachments here. This makes it easy to exchange files with other people through e-mail. Also notice how the name of the attachment is shown in a column in the mail view window. It is not possible to add filters for other specific types of attachments. Not all mailing lists are recognized by M2 because they lack the proper headers, which would identify them as mailing lists. In that case you will have to make a folder with a filter. Unfortunately this will not have threaded view. M2 is also a newsreader. News articles are also accessible via access points. An icon distinguishes between an e-mail and a news article. Under Mail > Newsgroups you can subscribe to various newsgroups. The subscribed newsgroups are then shown here. M2 naturally supports multiple accounts. 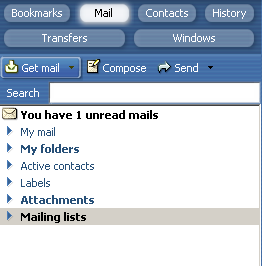 Mail from all (POP) accounts can be found in the "My Mail" folder, with separate access points for Received, queued (Outbox) and Sent mail, as well as Drafts, Spam and Trash. Inboxes for each of your IMAP accounts appear in "My Folders." And as you've seen, all of your mail is sorted by contact, type of attachment, and mailing list at the appropriate access points. The Mail import functionality has been improved and you can now import from Outlook Express, Eudora and Opera 6. Select File > Import > Mail to import your e-mail. 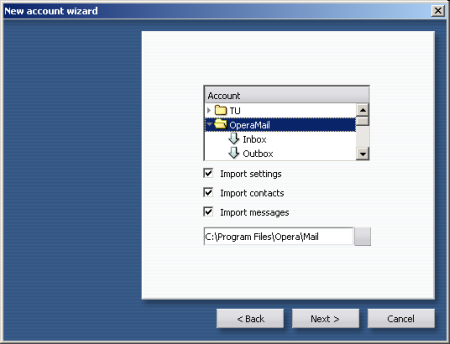 It is not yet possible to import e-mail from other Opera 7 installations. You can choose to import different accounts, folders, settings, contacts etc. When importing e-mail from Opera 6 the folder structure is copied to the "My folders" area and all the e-mails are located under "Received". The filtering properties are not imported, however. To continue using the classic folder structure for your e-mails you have to reconfigure the filtering criteria of the folders. Below a typical working procedure with M2 will be described, which uses M2's powerful abilities effectively. Note that this is merely one way of working! All access points are closed except the "Active contacts", "Labels" and "Mailing lists" and the mailing list items are set to not show up in the "Unread mails" access point. The new e-mails will show up in the "Unread mails" point, where they are marked read, given labels or deleted. New mailing list e-mails can be recognized by the bold mailing list access point (and the number of unread mails is also shown), so you will know there is new mail. If there are too many new mails to read all of them immediately, you could go to the "Active Contacts" and first read the mails from people whose opinion you generally consider more interesting. When all mails in "unread mails" and the mailing lists are read, and the "My Mail" is still bold, that means there is spam. You can decide to deal with them now or later. The "Labels" access point is left open because it reminds you of important e-mails and things to do. This is just a brief introduction to M2, and there are many powerful features available. The best way to learn more about M2 is to use it yourself. Please remember to report any bugs you find during beta testing. Before reporting these through our bug tracking system, it can be a good idea to discuss it with others in the MyOpera community forums, or in the opera.beta newsgroup.